Marketing has never been so cheap and accessible as it is today. A business whether sole proprietor, partnership, or private limited company can easily promote its product or services to their target market instead of spending billions of money on Banner Ads, Newspaper Ads, Television Ads. etc. for a single view. Mobile Messaging is the only way to reach anybody from an educated professional to basic literate person. In this mobile age, people like to make deals directly with the owner/customer knowing it fast to clear apprehension and take decisions accordingly. Schools, colleges, retailers, wholesalers, political parties, designers, Lawyers, Barbers, Accountants, Consultants, Tax Experts, and Solicitors etc can efficiently reach out to their targeted customers just by sending a single SMS. Can create project files and open later for different "Marketing Campaigns". Each project consists of "Devices", "Contacts", "Inbox", "Outbox" and "Sent"
Sony Ericsson: All "i" models like K750i etc. SMSGadget Bulk SMS Sender software used to send SMS from PC to a very focused group of customers. It should not be used to send spam SMS, unsolicited SMS or bulk SMS broadcasting for spam. How does SMSGadget Bulk SMS Sender work? Which brand of mobile phones does SMSGadget Bulk SMS Sender support? How can I remove the ADD text "Sent by SMSGadget" that is appended to all outgoing SMS? Question: How does SMSGadget Bulk SMS Sender work? Answer: SMSGadget Bulk SMS Sender is windows based software. It works by transmitting text messages through a GSM based mobile phone/GSM Modem connected to the computer. Question: What equipment(s) do I need? Answer: Our software supports GSM Modem or any kind of mobile phone supporting GSM Modem. Use your existing mobile phone and connect it to the computer. You are then ready to go! Most smartphone such as iPhone, Android, Windows Phone and Blackberry DO NOT WORK with our software. 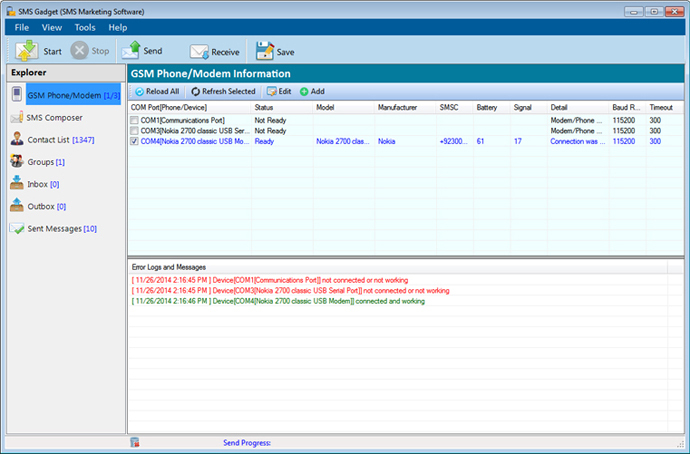 They simply do not provide a GSM modem in Windows. Please use an old Nokia, Sony Ericsson or Motorola phone. Also you may use 3G USB dongle such as Huawei. Question: How do I connect my phone to the computer? USB data cable works best because it is fast. Some of them provide power to the mobile phone also (called "Charging connectivity cable"). You need to install the appropriate driver before using it. It usually comes with the cable or can be found at the manufacturer's web site. Bluetooth is also a good choice. It is wireless, convenient and allows you to connect several phones or device at the same time. However, installing the driver and setting up the COM port need some works to do. If you are using Windows XP service pack 2 (SP2), it natively support Bluetooth dongle from CSR (Cambridge Silicon Radio). Another issue with using Bluetooth is the confirmation at the mobile phone side whenever you try to connect it from PC. If this cannot be suppressed, it would be very inconvenient. Luckily, Nokia, Sony Ericsson and Motorola phones provide such features. Using Infra-Red is feasible but not recommended. because the wireless range is very short, directional and unstable. Question: Where can I find the drivers for the USB data cable of my mobile phone? Question: Which brand of mobile phones does SMSGadget Bulk SMS Sender support? Question: Can I change or hide my phone number from the recipient? Comments: I foud SMS Gadget very useful and cheap equally. Without annoying any receipient of duplicates. Have the facility of sending sms from multiple devices at the same ime.